Jilly Anne is inspired by each childs creative thinking, lack of convention and consistent curiosity. We’ve taken a few minutes to sit down with Jilly Anne to learn what inspires her, what’s so great about Guardian Tempe and what’s next for children at the centre. Hey Jilly Anne, first things first, tell us a bit about your career background. I am qualified in Primary, Infants and Early childhood education, and have worked in schools in NSW and Victoria, even working my way up to School Principal in the Victorian Independent Schools System. Children are the last original thinkers on the planet. I love that they are not confined by convention or logic. Their minds are so open to wonder and possibility, and they have an innate love of learning, and a great sense of FUN! This makes it such a joyous profession to be involved in. Twofold. One is inspiring children to ask the right questions to grow their learning and their love of wonder. The other is doing the same for educators. This is where the good stuff happens, this is where we have the opportunity to teach children about trust, care, self expression, creativity and imagination. This is where they become caring. Not just about themselves, but about others, the environment, animals, books, language and culture. What do children love about Guardian Tempe? Our amazing educators and this incredible outdoor space! Is there anything exciting you’ve got planned for Tempe? Yes….. are you going to make me tell??? I am super excited for a massive clean up this weekend, for some rearranging of our spaces, for setting up exciting invitations to play. We have a new Educational Leader starting next month and I am so looking forward to growing our educational vision here. We will be moving to paperless programming, observations and reporting from next year. We will be introducing mid year verbal summative assessments, so that we are having more opportunities to get valuable and meaningful ideas from parents. Italy 2022! My husband’s family are from Trieste in the North and Sicily, so he has family all over. I have been lucky enough to have spent time in NZ (which I love), the UK, France, Thailand, Malaysia and Singapore, as well as Nepal. So Italy is next! Um, about that… I don’t cook. Hence the joy of marrying an Italian. He is amazing. His mushroom risotto is off the charts. 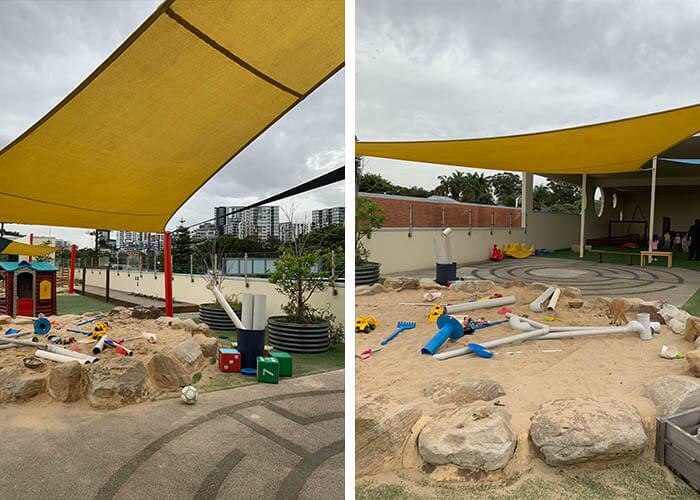 To find out more about this wonderful early learning centre in Sydney and to book a tour, head here.